Today I would like to talk about the variety of yarn available and its many uses. So just how do you chose the perfect yarn? Go shopping. That's how I do it. Some people start with the pattern, but I start with the yarn. For me, it all begins with that perfect yarn. I just love yarn shopping. I can spend hours perusing the different colors and textures available. I find it so inspiring to imagine everything I can make from the yarn. A nice heavy cotton yarn might inspire a fabulous rug or a lovely bamboo yarn might make me start thinking about summer shawls. It is all part of the creative process and it is different for all of us, but the one thing that doesn't change is that for your project to turn out exactly the way you want the perfect yarn is required. So how do you chose the perfect yarn? Well it depends on the project and what function the project will serve. While summer shawls are wonderfully done in light weight cotton and bamboo textiles, items like bags and potholders you will want a stronger and stiffer yarn used to prevent sagging and gaps. I like cotton for the potholders and t shirt yarn for bags and rugs. T shirt yarn takes the traffic better than anything else and it solves the problem of the sagging that occurs in crocheted and knitted bags. And I always have several balls of cotton yarn around because it is a nice soft and durable yarn that can be used in almost any project. I always replace a pattern calling for acrylic yarn with cotton. Sometimes you need something soft and plush for a baby blanket. I used a polyester yarn by Bernat called Pipsqueks. 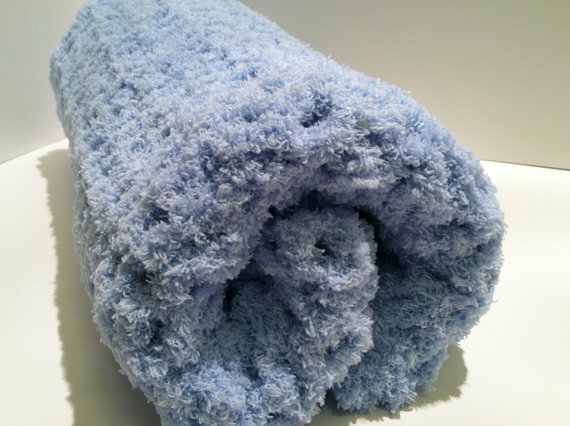 It is so plush that I imagine laying on these baby blankets are like laying on a cloud. This pattern will be available in my yarn supply store soon ( www.etsy.com/idlehandsyarnsupply). (shameless plug, I know...) The moment I touched this yarn in the store I knew it would make the perfect baby blanket. 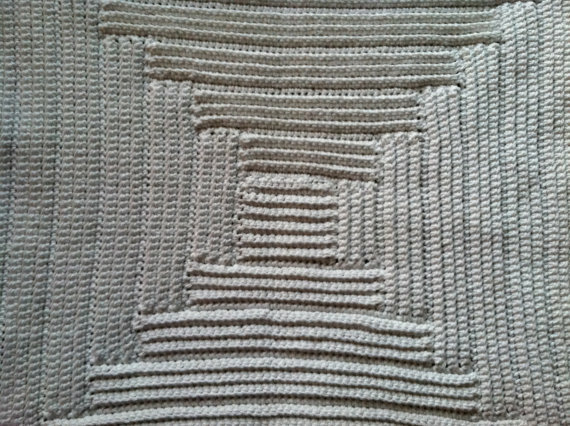 I didn't even intend to be making any baby blankets, but the yarn inspired me to create. And that is how my process works. I see some yarn and see the potential and it builds from there. I strongly encourage looking at recycled yarn from sweaters. You can find a fabulous variety of yarn in many different shades and blends that you can't find in the craft store. You never know when you will be struck by a brilliant idea just by browsing through yarn. This pattern will also soon be available in my yarn store. There are also some beautiful cottons available and many more in the process that will be ready soon (okay, last shameless act I promise!). It was meant to be a kitchen rug for my brother, but he has found a new use for it. He keeps it in his car to protect his car seat from the coffee he is perpetually spilling in his car. The cotton is so absorbent that it makes the perfect seat protector. So now I am working on a pattern for seat protectors made with cotton yarn. 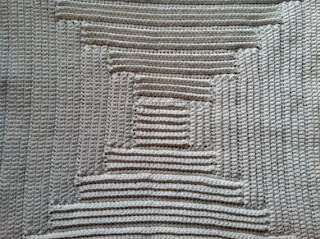 I have made the change to recycled yarn from sweaters so I won't be using the same yarn as I did with this, but this was done with one large skein of Bernat Handicrafter Cotton. This is what you call an eyelash yarn because the yarn is a very thin strand with "eyelashes" coming off of it that give it that fuzzy appearance. The items made from this are very soft and fuzzy and light. Definitely a cozy finish to any project. It is a fun yarn and has many potential uses from it being the primary medium used or it can be used to finish a project for a little added flair. 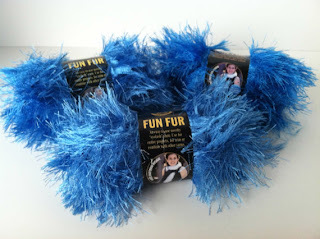 There are many kinds of novelty yarns that are worth a look. I use the Lion Brand Boa for making feathery light summer shawls. There are many varieties with many different textures that are worth looking at. When shopping for yarn, know what kind of yarns work best for the project you are doing. The Internet is a wonderful resource for this. I found a site that is wonderful for helping with substitutions. It has many different options and I have heard it is helpful for many people. http://www.yarndex.com/ has about every option you can think of. It should be a fabulous resource should you need it. Now, go find some yarn that makes you go "Aha!" and make something beautiful! Happy shopping!! !